I am, officially, on vacation, and I don't know if the switch to standard time affected the deadline for the print edition. On the assumption that the regular deadlines applied and the result didn't make it into print, here's the game story. And here's the box score. Much is being made of Ryan Howard's struggles so far in this World Series — two for 13 with nine strikeouts. There's really not a lot of reason to be surprised. Point no. 1: He strikes out a lot. Always has. Always will. In 2006, 181 K's. In '07, 199. In '08, 199 again. In '09, 186. The Phillies are willing to live with almost 200 K's a year from him in return for 40-plus homers, 80-plus extra base hits and 140-plus RBIs a year. Point no. 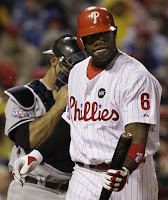 2: Ryan Howard vs. left-handed pitching in 2009: .207 batting average, .298 on-base percentage, .358 slugging percentage. The man slays righties, but can't handle southpaws. Seven of his 13 at-bats have come against lefties. Pretty much have to expect he's going to struggle under those circumstances. To be fair, he got two hits off southpaws in the first game. And he went 0-for-4 with four strikeouts in Game Two against A.J. Burnett and Mariano Rivera, both right-handers. Still, his series is panning out roughly as I anticipated when I predicted a Yankees victory. Tonight (Sunday) he faces CC Sabathia again. This series isn't getting any easier for Howard. I was browsing through the most recent issue of Baseball America and found in their Transactions column the news that the Twins had officially released pitchers Phil Humber and R.A. Dickey. No real surprises there. Dickey had a decent run with the Twins in the first half, then seemed to lose something on his hard knuckler, and once he went back to Triple A the Twins never saw fit to bring him back. Not that his 5.13 ERA in Rochester suggested he deserved to return. And the release of Humber reduced the return on Johan Santana to Carlos Gomez; Delois Guerra (who had a mild bounce-back season but is still not the prospect he was was the time of the trade); and, indirectly, Jon Rauch (acquired for Kevin Mulvey). The Twins cut Humber and Dickey loose early because it was obvious that they didn't fit into their plans. Which raises the question: What are the plans for the Twins 2010 pitching staff? What jobs are taken, what gaps need to be filled and who have they on hand to fill the gaps? Figure it's a 12-man staff again. Pitchers in parenthesis are eligible for free agency but with mutual interest in returning to the Twins. Some of these job descriptions are arbitrary, but reasonable. Comments: I put the vacancy in the No. 2 slot because that's really where the gap is. Slowey is a more talented pitcher than either Blackburn or Pavano, but he has yet to survive a full season in a major league rotation. Blackburn and Pavano are very good guys for the back end of a rotation; I rank Blackburn higher because he's thrown about twice as many innings as Pavano has over the past two years. The Twins need somebody who can challenge Baker for the title of best starter on the team. I don't think that pitcher is on hand right now. Kyle Gibson might get there some day; some still hold out hope for Francisco Liriano. I expect the Twins to re-sign Pavano or acquire some other veteran pitcher. Either way, a rotation slot is going to be filled with a younger arm. In-house candidates for the rotation: Liriano, Brian Duensing, Glen Perkins, Boof Bonser, Jeff Manship. If Manship opens the season in the rotation, it probably means a lot of injuries. If Perkins opens in the rotation after (a) compiling a 5.89 ERA last season; (b) irritating the coaching staff by complaining of injuries after poor outings and (c) filing a grievance after a late season demotion deprived him of arbitration eligibility, I'll be shocked. Comments: Mijares at times was used strictly as a LOOGY (Left-handed One Out GuY). One can argue that Rauch is the No. 2 set up guy and Mijares is the LOOGY. Like I said: Arbitrary. ... Not all that certain what Crain's contract status is. I believe his contract has expired but he isn't eligible to file for free agency, which makes him arbitration eligible. The Twins generally make an offer to such players, but they could cut him loose. His post-All-Star break ERA (2.91) suggest they'll keep him. ... Mahay is 38. He pitched poorly for Kansas City, well for the Twins, but it was just 9 innings for Minnesota spread through 16 appearances. Primary candidates: Pat Neshek, Bonser, Perkins, Duensing, Liriano. Neshek's the one guy in that list who doesn't make sense in the long man's role. If he's healthy, he's almost certain to push into that late inning pile with Guerrier, Rauch, Mijares and Crain. Which would push Mijares to the LOOGY job, and probably means a lefty has the inside track for the long man role. ... I include Perkins on the two lists of candidates only because he's still on the 40-man roster. The friction between him (and/or his agent) and the organization over his late-season demotion makes it increasingly unlikely that he'll be around next season. Yes, he was the losing pitcher Thursday night. But it was fascinating to watch Pedro Martinez pick apart the vaunted Yankees lineup with an 88-mph fastball — and his change, and guile, and an occasional curve. His place in baseball history is secure. As imposing as Johan Santana's run in the middle part of this decade was for the Twins, Martinez' run with Boston at the turn of the century was far superior. In a six-year span (beginning with 1997, his last season with Montreal — after which he was traded for a package headed by Carl Pavano) Martinez finished first in the Cy Young voting three times, second twice. He racked up — in the height of the steroid era, in Fenway Park no less — ERAs of 2.07, 1.74, 2.39 (injury year), 2.26 and 2.22. His peak velocity Thursday was about 10 mph lower than it was in his prime, but he has the great change and the command and the sheer pitching intelligence to make it work. He is one of those pitchers who can win with nothing as long as he is physically able to take the mound. One of the runs scored off him came on a fly ball that would have been an out in any other current park; another was set up by a base hit off the end of the bat. There is another parallel. In 1938, the Cubs picked up Dean for their stretch run, knowing he was injured, knowing his fast ball was gone. Ol' Diz went 7-1 with a 1.81 ERA for the Cubbies and helped them sneak into the World Series. Where he started Game 2. Against the Yankees of Joe DiMaggio, Lou Gehrig and Bill Dickey. And held a one-run lead (3-2) into the eighth inning, working with his change, his command, his pitching intelligence, before it all fell apart on him. Teams didn't have specialty bullpens in the late 30s; Dean was expected to go the distance. He lost 6-3. The Star Tribune isn't staffing the World Series this year. Nor is the Pioneer Press — indeed, from what one can glean from the St. Paul paper's Internet home page, there wasn't a game played last night. They're probably not alone. MLB this year held its first "media day," patterned after the NFL's media day early in Super Bowl week, with the express hope that it would entice more news outlets to the Series. The NFL's faux event often comes off as a joke, and I can't imagine why an attempt to duplicate it would be seen as a plus, but I'm not running MLB's media relations. It's no secret that the world of traditional media is in turmoil. Newspaper circulation is down — the 25 biggest U.S. papers, which includes the Strib but not the PP, lost about 10 percent of their collected circulation in the past quarter. Local TV news stations are struggling as well; a recently fired director at WCCO TV was quoted in the Star Tribune: It's a dying industry ... and quite honestly I don't think that they have the smarts to reinvent themselves. I'm not sure what LaVelle Neal or Kelsie Smith would provide from the Yankees-Phillies Series that the wire services can't, and I suppose the decision makers at their papers had the same conclusion. Plus — let's face it — sending a reporter to New York racks up the expenses faster than sending one to almost any other city. I'm not really surprised the Twin Cities metros aren't at the Series, just a bit saddened. It's another minor surrender. They have bigger battles to fight. The poll on who would win the World Series closed before the first pitch. It had 15 votes; eight picked the Yankees, seven the Phillies. I think it was 7-1 Phillies when I posted my prediction. I may have persuaded some of my readers, but not Cliff Lee. Anyway ... the new poll is different. Who are you rooting for, not who will win. Of course we’re going to win. If we’re nice we’ll let it go six (games), but I’m thinking five. Close it out at home. * The Yankees have played nine games in 24 days, a leisurely schedule by any measure. Mike Scoscia, whose Angels team had a much deeper starting rotation than did the Yanks, called the schedule "ridiculous," which of course it is, but we don't see him or his players turning down Fox's money. Yes, the extra off days allowed the Yankees to go with just three starting pitchers through the first two rounds. Managers have done that in the past. Tom Kelly used just three starters in both 1987 (Frank Viola, Bert Blyleven and Les Straker) and 1991 (Jack Morris, Kevin Tapani, Scott Erickson) — and after the '87 Series Whitey Herzog beefed about how the short series didn't expose the Twins weakness in he back of the rotation. October has historically been about front-line players, not the fifth starter. With the exception of "personal catchers" — see Jose Molina working with A.J. Burnett — we don't see the backup catchers in October either. My problem with all the off days isn't so much that it's possible to skip the fourth stater — its the loss of the sense of continuity baseball thrives on. And that means the longer the series goes, the better for the Phillies. Considering how eager Girardi has been to go for the kill, it's baffling that he'd take a Series start from Pettitte (or Burnett — I'd rather use a lefty like Pettitte against the Phillies than a righty) to give it to the last man on his pitching staff. I'll believe it when I see it. * The Houston Astros wanted Manny Acta, but refused to give him a three-year deal, so Acta took the Cleveland Indians job instead. Two years was enough for Brad Mills, however; he took the job. Which is the better job? If the Indians owner has a realistic notion of where the franchise is right now, Cleveland is — but he fact that Bobby Valentine was a finalist there suggests they have delusions of grandeur. 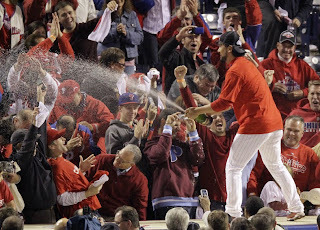 I like the Phillies, I really do, and I'm going to be rooting for them when Commissioner Bud and Fox finally let the games resume. But the Yankees are going to win. I say that not because the Yankees are the best team in the best league — which they are. Lesser teams have won the World Series before and will again — when the key matchups go their way. The matchups don't favor the Phillies this year. The key concept: The Yankees lineup is better equipped to deal with Philadelphia's best pitchers than the Phillies lineup is to deal with New York's best starters. Both teams feature a heavy reliance on left-handed starting pitchers. The Yankees have used just three starters this postseason: CC Sabathia (left-handed), A.J. Burnett (right) and Andy "no initials" Pettitte (left). 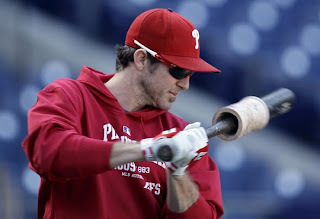 The power in the Phillies lineup — Chase Utley (above), Ryan Howard and Raul Ibanez — is left-handed. The Phillies' top two starters, Cliff Lee and Cole Hamels, are left-handed. But the Yankee lineup offers few left-handed hitters for them to torment. New York has four switch-hitters (Mark Teixeira, Jorge Posada, Nick Swisher and Melky Cabrera) — and two dangerous right-handed bats in Derek Jeter and Alex Rodriguez. Another point in the Yankees favor — they have spent the season ripping mediocre relief pitching. That's what underlies their impressive record of comeback and walk-off wins. The Phillies bullpen crew is not stellar. For all the headlines proclaiming that Brad Lidge has regained his form, his postseason outings have been tightrope affairs. That's not complex handicapping, but sometimes a simple analysis gets to the heart of the matter. Yankees in five. It's good to see a long-suffering team like the Yankees finally reach the World Series. * The Cleveland Indians, with a choice of a win-now manager from the outside (Bobby Valentine) and a veteran of their farm system to supervise a rebuilding project (Torey Lovullo), split the difference to hire Manny Acta. Acta (above) is a more sensible choice than Valentine, who told the Cleveland media after his interview that he and the Tribe may not be a good fit. But the reality for the Indians is that they are rebuilding and they're going to take their lumps in 2010. Lovullo would have made more sense. Of course, it's possible that general manager Mark Shapiro doesn't have enough security to write off 2010 — in which case he'll make more, and worse, mistakes in the offseason that's just beginning. * The current issue of Baseball America names Joe Mauer its Major League Player of the Year. Mauer is the first player to be BA's High School Player of the year, Minor League Player of the Year, and Major League Player of the Year. *Tony LaRussa will return as St. Louis manager. Just as important: pitching coach Dave Duncan, who was vocally on the outs with the front office during the season, will return also. Less important, but certain to make headlines: Mark McGwire will be the hitting coach. LaRussa was, at best, a passive encourager of the rise of steroids in the late 80s and throughout the 90s. Even after the backlash, he vocally sought to bring Barry Bonds to the Cardinals and defended Rick Ankiel's use of human growth hormone. And now he's trying to rehabilitate McGwire's image. Here, as promised in the Monday print column, is the Wall Street Journal story on Max Kepler-Rozycki. It's easy to get carried away when reading about prospects like Kepler-Rozycki or Miguel Angel Sano. A veteran scout watches Sano, and his memory bank flips through the young players he's seen, and the comps he comes up with are Alex Rodriguez and Hanley Ramirez — Dominican shortstops with size and hitting ability. And that's what he puts on his report, because that's his job — to project what he sees now into the future. And that's what the Twins are spending $3 million-plus on — the very real chance that four or five years down the road they'll have a sizable Dominican shortstop with a big bat. But he's 16 — probably, maybe. Or he's 18 or 19. He has yet to swing at a professional pitch in anger, has yet to play a night game and ride a bus a few hundred miles, has yet to endure an 0-for-5. Kepler-Rozycki is a high school student, albeit one with a unique summer job. He is assuredly 16 — and even more assuredly a raw talent. Some amateur signees are on the fast track. Kyle Gibson (above) probably should be one of them. Like Sano and Kepler-Rozycki, he has yet to play a pro game in earnest, but he's a college signee and far more polished. Sano and Kepler-Rozycki should be assumed to be years away from the majors until they prove otherwise. They're on the slow track to the majors. Which doesn't keep us from dreaming a little. That may be a scout's job, but it's the fans' privilege — although a sense of realism helps. The poll on the Twins third-base job is now closed, and the results suggest that the readers (a) aren't sold on Matt Tolbert and (b) want something new. Danny Valencia, who didn't get a September call-up, got eight of the 15 votes (53 percent). Tolbert, who hit .232 for the season but .333 in September-October as he got regular playing time, got three votes (20 percent). Joe Crede got 2 votes (13 percent), as did a return to 2007's platoon of Brendan Harris and Brian Buscher. Most of my polls have gotten at least 20 votes (not that 20 is that impressive a number), and the missing five votes might mean that the four options listed didn't appeal to a fourth of the the usual crowd. I had intended to put up a World Series poll today, but with the ALCS not yet complete, that will wait. 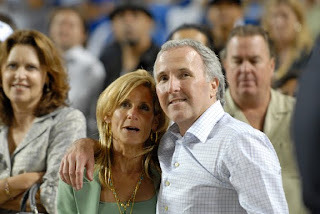 The future of the Los Angeles Dodgers of Los Angeles got a bit uglier Thursday as the pending divorce of Frank and Jamie McCourt (above, in happier times) got a bit nastier. Frank McCourt is the official owner of the Dodgers; Jamie is the CEO, or had been. They announced their separation last week; on Thursday, the Dodgers announced that Jamie had been fired as CEO. The experience of the San Diego Padres the past year or so is not an encouraging template for Dodgers fans. The divorce proceedings of John and Becky Moores first stripped the club of operating capital, resulting in the departures of, among other veterans, franchise icon Trevor Hoffman. Then it resulted in the sale of the franchise to a group headed by former superagent (and former Boras rival) Jeffery Moorad, who has since fired long-time GM Kevin Towers. And that's a situation in which one of the divorcing spouses (Becky Moores) had no official role in the operation. *I don't know that the Fox boys ever mentioned him — they probably didn't notice him, observant as they are — but baseball's Lucifer, Scott Boras, was in the field-level seats right behind home plate Thursday, a constant presence over plate umpire Fieldin Culbreth's right shoulder in the basic TV shot from left-center field. Boras is well represented in the ALCS — his clients include Alex Rodriguez, Mark Teixiera and Johnny Damon of the the Yankees and Jered Weaver of the "Los Angeles" Angels of Anaheim. And while the free agent season hasn't started yet, he (or his minons) have already started the public jockeying, feeding favored journalistic bobo Jon Heyman the line that free agent outfielder Matt Holliday prefers the Yankees to all others. Damon, of course, is the current Yankees left fielder. Ah, the plight of Boras. Which client does he burn? Probable answer: Which one will bring him the smaller commission? Joe Nathan had two bone chips removed from his elbow Tuesday. He's expected to be recovered from the "cleanup" surgery by spring training. It's not a huge shock that he had something wrong. He pulled out of the World Baseball Classic this spring, saying that he wasn't ready to pitch competitively that early, and while he saved 12 of 13 chances in Sept./Oct., he really didn't pitch well — by his standards, at least (3.38 ERA). And of course, he had a brutal outing in the ALDS against the Yankees. How long he's had the problem, I don't know. His fastball velocity slipped two years ago, so I'm guessing he's pitched through the problem for a while. Bill Clinton had a much-parodied line: I feel your pain. I don't think we do. I heard today a talk-radio idiot jeer at Justin Morneau for his second-half slump, and wondered: What part of a fractured vertebra don't you understand? So too with Nathan. He pitched hurt, he worked more innings in Sept./Oct. than any other closer, and Patrick Reusse calls him a choker. There's a old story — I've seen versions of it starring Sparky Anderson and Earl Weaver, so it's probably apocryphal — of a manager visiting a laboring pitcher. Manager: How do you feel? Manager: Really? It don't bother me none. And that's true. We don't feel Morneau's back, and we don't feel Nathan's elbow. We don't feel their pain, so it doesn't count. That was a rather efficient dismantling of the Dodgers in the NLCS, wasn't it? Philadelphia took the Dodgers' strong suit — the bullpen — and whupped up on it. The American League, I have said repeatedly for years, is far the superior league. But the Phillies are capable of beating the Yankees — and yes, the ALCS isn't over yet, but Anaheim isn't winning this thing — just as they beat Tampa Bay last October. I'll write at some length about the World Series matchup another time, but my gut tells me that this guy might be the decisive player. He was the biggest reason the Phillies won the postseason tournament in 2008, but he hasn't dominated at all in 2009, and his 6.75 through three postseason starts isn't getting it done this year. The Twins' signing of much-hyped Dominican shortstop prospect Miguel Angel Sano became official this week. They're still not sure the kid's really just 16, and it's quite likely that he won't remain a shortstop, but it's one of a series of signings and draft picks this year that indicates the Twins are pushing harder for top-shelf amateur talent. Out in Detroit, Carlos Guillen popped off about Jim Leyland and playing left field, then he and Leyland had a phone chat, and supposedly everything's OK now. Supposedly. The fact remains that Guillen is 34. He has a bad knee and a bad shoulder, a $10 million salary for 2010 and steadily declining numbers. That's the very image of a player in decline. Leyland can say now that Guillen will be his nine-inning left fielder in 2010, but that doesn't make it so, or make it wise. A somewhat bewildering field of managerial finalists in Cleveland — Bobby Valentine, who would figure to be a win-now selection; Manny Acta, who was fired in midseason in Washington; and Torey L0vullo, who has been managing in the Indians farm system. It seems to be me that Lovullo would be the logical choice. Given the trades GM Mark Shapiro has made the last two seasons, the Indians appear to be in rebuilding mode — trades of CC Sabathia, Cliff Lee, Casey Blake, Mark DeRosa and Victor Martinez had pumped an enviable amount of young talent into the organization. But it's hardly certain that Shapiro has the long leash to write off 2010. Valentine makes no sense from any perspective for Cleveland. "We have Hall of Fame players"
"This team's good. We have great players, Hall of Fame players," said (CC) Sabathia, who has won three of the Yankees' seven playoff games. "We've got all the confidence in the world." Every once in a while somebody who really ought to know better will write something about a World Series matchup that says something like: There are no Hall of Famers in this series. Tom Boswell, a great baseball writer, said that during the 1991 World Series. Kirby Puckett's in, and Tom Glavine and John Smoltz someday will be, but Boswell didn't have the imagination to see it. The fact is that almost every team that wins a World Series — and, indeed, the losers — has at least one play on is roster who is Cooperstown bound. Sometimes they're just getting started, sometimes they're on their way out. The furthest back one finds a Series winner without a Hall of Fame player is 1984, the Detroit Tigers. Their best candidates are Jack Morris and Alan Trammell. There are worse pitchers than Morris in the Hall (and better ones outside); Trammell is not only better than several enshrined shortstops, he's probably the best eligible one not in. But there seems little inclination from the writers to enshrine either. Next up is the 1990 Reds, but I figure Barry Larkin will get in once eligible. And the champs to follow that don't have an enshrinee by now have guys who figure to get in someday — Glavine or Derek Jeter (above), Pudge Rodriguez or Randy Johnson. So yeah, the Yankees have some players destined for the Hall of Fame — Jeter and Mariano Rivera, Alex Rodriguez, possibly Sabathia himself. That, in itself, doesn't mean all that much. The Phillies do too. More blown calls in Tuesday's ALCS game. And this time two of them came from an ump universally regarded as one of the very best: Tim McClelland. McClelland erred in ruling that Nick Swisher left third too soon on a fly out. And he erred in ruling that Robinson Cano was safe when he and Jorge Posada pulled off the old Daffyness Boys Dodgers trick of multiple men on third — or, to be strictly accurate, nobody on third, but multiple guys standing around it. McClelland, to his credit, was big enough to face the media after the game — unlike, for example, Phil Cuzzi — and admit his foulups — unlike, for example, Randy Marsh. But then, McClelland is the crew chief. He had nobody to hide behind. And the video evidence was too damning to ignore. I can understand how he missed the Swisher call — and will even give him a certain amount of credit for making the call, there being a lot of umps who simply won't call a runner out on an appeal play unless it's so blatant that there won't be an argument. (Which doesn't mean he got it right.) But the Posada-Cano call ... I can't wrap my brain around that one. Neither was anywhere near the bag when tagged. I gripe a lot — more than I should — about baseball broadcasters. Today I contemplated the utter silliness of the sponsorship of the keys of the game segment early in Fox' broadcast, and, for the first time, felt sorry for Joe Buck. How much did he have to rehearse to say "the Ninja Assassin keys to the game" with a straight face? If Mariano Rivera wasn't spitting on the ball here, what was he doing? Update: I just threw up the link this morning and took off to run some errands. Since then, MLB (according to the New York Post) has declared the scanty evidence of Fox's video to be inaccurate, that Rivera was not spitting directly on the ball. 1) I do wish Fox had stuck with this camera shot a bit longer. It's not like nobody knows that Mike Scoscia's in the dugout. But their production values are similar to Joe Girardi handling his relief corps — hyperactive. We don't get to see what followed Rivera's spit — or even where it landed. 2) I really doubt that Rivera has made a habit of doctoring the ball. If he does, he doesn't do it so blatantly. 3) There are far fewer pitchers suspected now of doctoring the ball — by scuffing it or applying a "foreign substance" — than there were 20, 25, 30 years ago. Why? The very reason this is a subject today — there are dozens of video cameras recording virtually every move a pitcher makes. A cheating pitcher is far more likely to be caught on tape now than in Gaylord Perry's heyday. 4) If Rivera was loading one up, it was an odd time to do it — the no. 9 hitter up in a bunt situation. Throwing a spitter in those circumstances just increases the chances for a fielding misplay. Say ... that's what happened, isn't it? It's kind of amusing to see Joe Girardi getting pilloried for switching from one right-handed reliever (David Robertson) to another (Alfredo Aceves) in mid inning. Girardi outmanaged — by himself says the Daily News. This is the way managers handle their bullpens nowadays — playing matchups. Or playing with matches. Eventually they find somebody who doesn't have it that day, and then they get burned. Girardi isn't going into detail on why he wanted Aceves rather than Robertson in the 11th inning after Robertson got the first two outs: "It's just different kind of stuff against those hitters. We have all the matchups and all the scouting reports, and we felt [Aceves] was a better matchup." The scounting reports I've seen on Robertson say he has a quality fastball and curve; Aceves has average stuff, including a change. 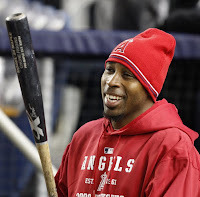 I suspect, therefore, that the Yankees scouting report says to use the change to get Howie Kendrick (above) out. Aceves was the eighth pitcher Girardi used in Game 3. It took Girardi a while, but he found one without good stuff. Girardi had been 5-0 running relievers in and out. Now he's 5-1. And he's still got CC Sabathia pitching Tuesday. The Fat Man has a way of making bullpens irrelevant. Game 4 might be the key game of the ALCS. Sabathia's on short rest. If the Angels can knock him off, they might win this series. I remain doubtful. Over in the other LCS, the Phillies are now one win away from a return to the World Series. And on paper, the Phillies have the advantage in every pitching matchup. Of course, on paper, the Dodgers have the advantage when the games go to the bullpens, but on Monday, the Phillies pen was solid and the Dodgers closer failed. I suspect the Phillies would love to see the Angels win the ALCS. 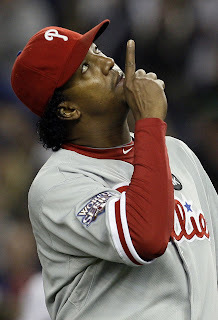 That way they can line up Pedro Martinez for more warm-weather starts. I'm not sure how well his arm will respond to chilly weather. And that I've turned my thoughts to how to handle Pedro in the World Series tell you what I think of the Dodgers' chances. A lot of the experienced hands are out of action. Seven crew chiefs are unavailable for postseason assignments with injuries ranging from testicular cancer (John Hershbeck) to a stroke (Rick Reed) to concussions to back problems. Crew chiefs got those positions with years of service — and by being good umpires. That umps like Ed Montague and Hershbeck aren't available is part of why umps like Phil Cuzzi and Laz Diaz (above) got October assignments. But just part of it. As Ringolsby details, there are a variety of work rules in the union agreement that restrict how often the best umps work the playoffs and World Series. Rob Neyer's take on this: Baseball needs to push its older umps into retirement. Really? If the problem we're seeing this fall is that the younger umps are fouling up, and (big if here) if the best of the younger umps are in the majors (as opposed to being stuck in the minors waiting for an opening), moving the old guys out isn't going to help. We see some of the likely prospects for full time jobs already as vacation fill-ins. Mike Muchlinski, anybody? I don't think so. Nine — 42 percent— opted for Game 7 of the 1991 World Series. That was, of course, Jack Morris' 10-inning shutout. Six (28 percent) voted for Game 6 of that same World Series (Kirby Puckett's homer and catch). And six chose this year's play-in game, Game 163. The new poll is tied, more or less, to the Monday print column. This game ended well after our press deadline, so here is the AP game story. The winning run scored because Anaheim's second baseman, Macier Izturis, made an over-aggressive play. Men on first and second, one out, a grounder to Izturis's glove side. Instead of taking the sure out at first base, he tried for the tougher out at second, presumably in hopes of getting an inning-ending double play. He threw the ball past shortstop Erick Aybar, and Hairston scored (right). Too aggressive. It was a dicey DP ball, and there was no reason to worry about a second runner in scoring position. Only Hairston mattered. Take the sure out, take your chances on the next hitter. The Yankees thrive on other teams' over-aggressiveness. Torii Hunter in the first game of the series. Nick Punto and Carlos Gomez on the base paths in the division series. You don't see the Yankees diving for balls on defense, and you don't see them taking chances running the bases. Earl Weaver would approve; he didn't want his players diving and running into walls. Such plays can result in injuries and misplays. Take the easy base, take the sure out, be in position, make the percentages work in your favor. 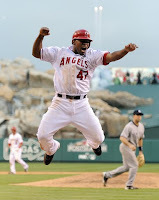 The Angels pride themselves on their aggressiveness. In the regular season, against bad teams, that can be effective. Bad teams miss cutoff men; bad teams throw to the wrong bases; bad teams can be pressured into making mistakes. Flash and dash don't fare so well against good percentage baseball. "It was about as cold as it gets. It was pretty nasty today." You ain't seen nothin' yet, CC. The official temperature at game time in Yankee Stadium on Friday was 45 degrees. But it was windy and rainy and pretty darn miserable — and it's probably going to be worse for tonight's scheduled Game 2. I'm willing to chalk up the lousy weather so far this postseason to bad luck. But we're in mid-October now, and the prospects for Indian summer are waning fast. Bud Selig wanted a schedule that pushed the World Series into November, and he got it. He deserves all the snow, ice and frostbite a Phillies-Yankees series can offer. *It's not really the playoffs unless Torii Hunter overruns a single to turn it into extra bases. He did it twice while with the Twins, and he did it again Friday night for Anaheim. This time he did it on a grass field, so the ball didn't roll on to the outfield fence for four bases. And at least this time he got charged with an error. Officially, Anaheim was charged with three errors. But that doesn't count the first inning popup Erick Aybar and Chone Figgins neglected to corral. That was counted as a hit — and a two-out run. * The Yankees plan to work Sabathia on three days rest in Game 4; if the games are played as scheduled, that will allow them to go with just three starters in the ALCS while not working anybody else on short rest. A postponement tonight would change that. Sabathia should be able to handle a start on short rest. He had a lighter workload this season (231 innings, as opposed to 253 last year and 241 in 2007), so the weariness factor that seemed the likely cause of his playoff implosion the past two years shouldn't be a factor. * A great job Friday by Pedro Martinez, who tossed seven shutout innings on 87 pitches against the Dodgers. 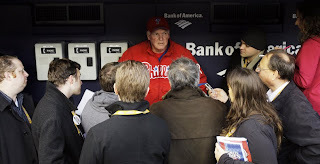 After which the Phillies middle relief spent the eight inning demonstrating why it's not easy to be Charlie Manuel. It took five relievers to get three outs. Of course, things might have worked out had Chase Utley made a routine double play pivot. Second time in as many games that Utley — regarded as a superior defensive second baseman — has thrown away a DP ball. And for that matter, the Phillies scored just one run off former Phillie Vincente Padilla. I think they expected to crack Padilla like a bag of roasted peanuts. Didn't happen. Should have. He's not that good. So the NLDS is tied at one game apiece — and the series moves to the chill (I assume) of Philadelphia. Mike Cuellar pitched seven years in regular rotation for Earl Weaver, going 139-75 from 1969-1975. But things didn't go so well in 1976 — he finished the season 4-13 with a 4.96 ERA, this in an era when an ERA in the fours was pretty awful — and Weaver yanked him from the rotation about halfway through the season. Cuellar complained that Weaver hadn't given him a chance to get straightened out. Weaver's retort: "I gave Mike more chances than my first wife." How many chances to give a pitcher who's done the job before is a question that has bedeviled many a manager. Charlie Manuel's handling of Brad Lidge this season is an extreme case of patience — of more chances than Weaver's first wife. Yes, Lidge had 31 saves. He also had an ERA of 7.21. This is not a misprint. He had 11 blown saves and an 0-8 record. There were worse pitchers than him, but not many. And none who are still getting the ball. Manuel has stuck with Lidge, believing in the talent — and, perhaps, counting on the fact that 58 innings, even over the course of a season, is a small sample size. He spent much of September focused on rebuilding Lidge's psyche and pitches. Perhaps it has worked. Lidge has three saves so far this postseason. They haven't been pretty ones — on Thursday against the Dodgers, for example, he allowed two baserunners. Whether he can keep this up, we'll see. But Manuel made his decision, right or wrong, weeks ago. Four high-profile closers — 150 saves in 2009 amongst them — blew ninth-inning leads in the first round of the playoffs. And in retrospect, those blown leads couldn't have been much of a surprise to their team's fan bases, even after seasons of success. Ryan Franklin, St. Louis, Game 2 against Los Angeles. Franklin's ERA in September/October was 6.75. 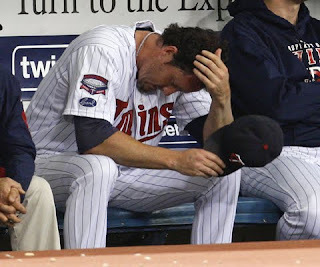 Joe Nathan, Minnesota, Game 2 against New York. Nathan's September/October ERA was 3.38. Of more alarm, he had given up four homers in that period — more than in the rest of the season combined — and pitched 16 innings, almost 50 percent more than the other closers involved in these blown saves. He was, of necessity, worked hard down the stretch, and he's about to turn 35. Jonathan Papelbon, Boston, Game 3 against Anaheim. No real issues here; he had last blown a save opportunity in July, his September/October ERA was 1.58, he hadn't walked a batter since August 24. Still, there were rumblings in the Nation that he wasn't quite as dominant in 2009 as they're used to seeing. Huston Street (photo above), Colorado, Game 4 against Philadelphia. For that matter, he took the loss in Game 3, which wasn't a save opp. Street's September/October ERA (3.38) wasn't much worse than his season ERA (3.09), but he had a three-week gap in September in which he didn't pitch, and his August ERA was 5.79. As the boilerplate financial services disclaimer says, past results do not guarantee future performance. Huston Street has been linked to the Twins year after year in trade rumors. He had a very good year for Colorado this season — the 3.06 ERA is no indication of how well he pitched — but tonight he took the loss for the second straight game. The umpire shared the blame for Sunday's debacle, but Monday's was all on Street. Meanwhile, Brad Lidge — perfect last season in save opportunities for the Phillies, and perfectly awful this season (7.21 ERA) — wound up with his second straight save. Go figure. I wouldn't say Lidge (above) is back in form. His save Sunday was hardly impressive, and manager Charlie Manuel went with LOOGY Scott Eyre for four batters in the ninth inning Monday. Eyre faced four batters in all of September. So Manuel — who has been excruciatingly patient with Lidge's struggles all season — wasn't fully trusting him Monday. You couldn't ask for a more glaring difference in pitching staffs in the NLCS. Los Angeles has no real ace starter, but boasts a deep and flexible bullpen. The Phillies have, in Cliff Lee and Cole Hamels, two top-flight starting pitchers, and no real confidence in anybody in the 'pen. Now we have several days without baseball so that Bud Selig can have his November World Series. For what little it's worth, I'll pick the Phillies over the Dodgers in the NLCS, and the Yankees over the Angels. And I'll root for the Phillies and Angels. It was just something for me to bring a little piece of this place to the new place, sprinkle that on the mound. We've had some good times in this building. — Joe Nathan after returning to the Metrodome mound after Sunday's game to grab a handful of dirt, which he plans to sprinkle on the mound at Target Field. 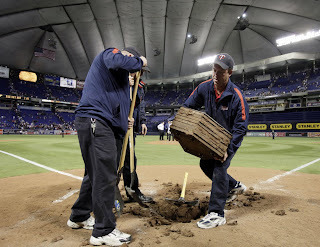 * The photo above is of the removal of home plate from the Dome after Sunday's game, the last game the Twins will play in the Dome. Didn't know it was so thick, did you? 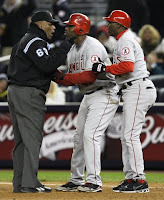 * Another bad umpiring call played a key role in Sunday's playoff games. In the ninth inning in Coors Field, Philadelphia's Chase Utley checked his swing and bounced a dribbler off himself — and took for for first base. Home plate umpire Jerry Meals ruled it a fair ball, Utley had a "single" — the call at first base was rather dubious as well — and the Phillies wound up scoring the tie-breaking run. * It's been a rough first round on closers. 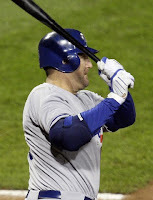 Nathan blew a two-run lead in the ninth inning on Friday. The night before, Ryan Franklin, the Cardinals' All-Star closer, coughed up a ninth-inning lead (with a little help from Matt Holliday). On Sunday night, Huston Street, pitching in a tied game, was the victim of the Jerry Meals bob-boo. And earlier Sunday, Jonathan Papelbon coughed up a 6-4 lead for the Red Sox with three runs in the ninth. It took four years after the start of divisional play in 1969 for somebody — reliever or starter — to blow a ninth-inning lead in the playoffs. This year it's a daily occurrence. * One reason Nick Punto got caught off third base Sunday: Derek Jeter has more range up the middle than he once did. While everybody else surrounding the Yankees denied what the newfangled fielding stats said about him, Jeter recognized the truth and did something about it. I suspect that two years ago — maybe even last season — Punto would have been correct in his assumption that Span's grounder had gotten through the infield. I figured at the moment of the tag exactly what Nick Punto was thinking when he made his baserunning error (above) in the eighth inning Sunday. He was, I thought, trying to make the same play Denard Span made last year against the Yankees. The problem was, Derek Jeter remembered it too. The game was on August 11, 2008. Here's the link to Baseball Reference's box score and play by play. In the eighth inning, Span was on second base (and Joe Mauer on first) with two outs. Justin Morneau hit a chopper up the middle. Jeter gloved it and looked to first, and while he was doing that, Span — running hard on contact with two outs — steamed home. The play clearly stuck in Jeter's mind. He was looking for it Tuesday with Punto on second. When he fielded Span's chopper behind second, he clearly had no intention of throwing to first — he knew Punto was going to be aggressive. And had he tried to throw out Span, Punto would have scored. It could have worked. It probably would have worked on any other shortstop. But Jeter had been burned once by this team on that play. It wasn't going to happen again. As it turns out, Punto thought, from the crowd's roar, that the ball had gone through the infield. It amounts to the same thing, though — Punto had committed to go home, and Jeter was looking for it. So much for the Metrodome. So much for the Twins this postseason. The outcome of this series wasn't surprising; the 2009 Yankees are clearly the best team in the American League. Their major weaknesses during the regular season — the fourth and fifth slots in the starting rotation — are almost meaningless in October. I'll root for the Angels in the ALCS anyway. If there wasn't enough time after game 163 to savor its magnificence, there's been too much time since Game 2 of the Twins -Yankees series. Now everybody's obsessing with the bad umpiring. Between Phil Cuzzi's inability to distinguish fair from foul from 10 feet away, C.B. Bucknor's (above) inability to figure out if a first baseman is touching the base and Randy Marsh's inability to see a ball graze a jersey, there are increasing calls for expanded use of replay review. It's getting harder and harder to defend the guys in blue, who on the whole do a heck of a job. A part of you has to feel for them, but another has to expect them to get it right the first time. (B)aseball replay is inescapable now because these playoffs have been an umpiring disaster. I don’t know if it’s a trend — it probably isn’t a trend. It’s probably just a bad run of high-profile missed calls. But it has felt like an epidemic, and it was topped by the almost-impossible-to-believe missed call on Joe Mauer’s sure-double against the Yankees — that ball was fair by a foot. Trend or not, this is the sort of thing that gets people talking, and the talk now is replay. The guy (Cuzzi) made a mistake. You move on and we do the best we can. .... I didn’t see the play, so I would have had coaches in the booth calling in my ear on my headset. Give me a headset, give me a red flag, and we can fix this stuff. But I’d have to have somebody calling in my ear to throw the flag. That’s a wall MLB hides behind: that even if Mauer were on second, who’s to say Jason Kubel and Michael Cuddyer would’ve followed with singles? ... A sign something is totally backward: When the players wronged by an umpire are the ones whose later success can bail him out. One (3 percent) hated the place from the get-go; seven (26 percent) said they'll miss the roof; 15 (57 percent) said it was OK but time to move on; and three (11 percent) loved the joint. On to the next poll, which ties in to the Monday print column. The Chicago Sun-Times suggests that Jim Thome (left) — he of the 564 career home runs, about half of them against Minnesota (not really) — has the Twins fairly high on his wish list for next season. I can't quite see it. The Jason Kubel-in-right-field thing going on now is strictly, and obviously, because Justin Morneau can't play. Next season, when Morneau's healthy, he's back at first, and Michael Cuddyer's back in right, and Kubel's back at DH. Which leaves no room for Thome. I suppose it's possible Delmon Young could be moved on out — perhaps his second half success (.300/.322/.502) has created a market for him — but it's difficult to imagine this organization valuing a 39-year-old without a position over a 24-year-old outfielder. It's more likely that Young's second half has convinced the organization that he's about to blossom. The story makes it clear that Thome's first choice is the White Sox, and I rather expect him to wind up there. I find the notion that the Sox might go with Scott Podsednik at DH to get speed in the lineup perplexing. Speed is better than slow because speed has a defensive function. There's a reason DH's don't hit leadoff; if you can run, you're going to find a place to play in the field. DH is a place to hide a sluggardly slugger. But Chicago has budget issues after adding Jake Peavy and Alex Rios. It may be a lot easier to fit Mark Kotsay in their financial scheme than Thome. We'll see this winter. Right now, Thome's got a job as the highest-paid pinch hitter in baseball history — and waiting to DH again should the Dodgers reach the World Series. We got that postgame response Tuesday from Randy Marsh, specifically on the no-call on the Brandon Inge hit-by-pitch. We got that response, more or less, in August from Hunter Wendelstadt, who, with the aid of his umpire mates, clearly screwed up multiple calls and claimed later that the replays upheld his calls. As I wrote later, if young Wendelstadt watched replays after the game, they were from different games. Then there was Mike Muchlinski's blown call — I may never forget or forgive this one — on July 20. As memory serves, the umpires refused to even discuss this one with reporters, I assume to protect Muchlinski, a vacation fill-in. "There's a guy sitting over in the umpire's dressing room that feels horrible," (crew chief Tim) Tschida said. "I've been there." OK, it might be better if Phil Cuzzi himself was come out to say that. Cuzzi was the left field umpire with one major job — to make fair-foul calls — and he blew the call in the 11th inning Friday. Now, again: The Twins had plenty of opportunities to win that game long before everybody watching the game knew Phil Cuzzi was on the field. Between Joe Nathan, Carlos Gomez, and 17 men left on base — Joe Mauer had two hits and two walks and was not involved in any scores — there are plenty of other reasons the Twins lost Game 2. The bitter part of me jeers that Mark Teixeira's walk-off homer was just as inside the line as Joe Mauer's leadoff "foul ball" in the top half of the 11th inning. But the fact remains that the Twins had the bases loaded with nobody out in the 11th and did nothing with it. Both Delmon Young and Carlos Gomez went out on the first pitch, although Young did hit a hard liner. Go-Go was fooled but went ahead with his first-pitch hack anyway. And, of course, Gomez's pratfall early in the game cost the Twins a run. Bottom line: The Twins found ways, again, to blow an imminently winnable game at Yankee Stadium. You can blame the umpire if you want. But Phil Cuzzi's missed call — like Randy Marsh's missed calls in Tuesday's Game 163 — had less of an effect on the outcome than the mistakes and blunders of the players. And now the Twins are down 2-0 in a best of five series. One aspect of this year's division series that is jumping out at me is the horrid umpiring. C.B. 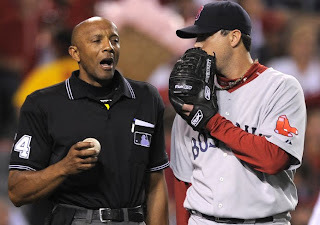 Bucknor had a brutal game at first base in the Thursday opener of the Angels-Red Sox series. Chuck Meriweather, if the TBS pitch track graphic has any accuracy at all, had no idea where the outside corner was Friday in the Twins game. Cuzzi's mistake in that same game was blatant. Bob Davidson, my personal choice as worst umpire going, has had a plate assignment. And while Game 163 wasn't actually a playoff game, it was not well umpired either. Some of these guys, to put it brutally, have little business umping major league games, period, much less playoff games. As I understand it, the World Series and LCS assignments are based strictly on merit. The playoffs, not so much. Merit counts, but there's a rotation used as well — and let's face it, there aren't enough really top-flight umpires to fill 24 slots. The more screwups they have in the postseason, the more calls there will be to install instant replay reviews for everything. As if games involving the Yankees, Red Sox and Cardinals aren't too long already. * The St. Louis Cardinals lost Game 2 of the NLDS Thursday when (a) the always-overrated Matt Holliday let a routine fly hit him in the belly button with two outs in the ninth (above) and (b) closer Ryan Franklin apparently decided that absolved him of the need to throw strikes. I mean, that ball got lost in 50,000 white towels shaking in front of Matt’s face. It doesn’t really seem fair that an opposing team should be able to allow their fans to shake white towels when there’s a white baseball flying through the air. How about Dodger Blue towels? Someday I'd like to see a Tony LaRussa team lose with some class. It may take a while. I'm really upset that it ended the way it did, having Brandon get hit by a pitch, because that totally changes that game. I can understand how the ump didn't see the pitch hit him, but to say video was inconclusive upsets me, because everybody in America saw that it did. OK, Mr. Leyland. I'm willing to concede umpire Randy Marsh blew that call if you're willing to admit Marsh missed the call on Alexi Casilla's slide home in the 10th. It he gets that one right, there's no 12th inning anyway. For that matter, perhaps you would acknowledge that letting Gerald Laird swing away on 3-1 with the bases loaded was a mistake. Oh wait. That would be your mistake. Better to pin it on the ump. * Speaking of the Detroit Tigers: Detroit GM David Dombrowski, who had the pleasant chore of fetching his $153 million first baseman from police custody last weekend, implied during his end-of-season press briefing that (a) this isn't the first time Miguel Cabrera has had too much to drink and (b) that he urged Cabrera, in a meeting Wednesday with the slugger and his agent, to get treatment. Implied rather than stated outright, with a lot of talk about the team's obligations and limitations under the collective bargaining agreement and employee assistance program. In other words: We can't make him do anything about his problem. It wasn't sweet Tuesday night hearing fans chant "al-co-hol-ic" at Cabrera. The only defense for it is that it's true. Meanwhile, there is serious speculation that Cabrera may still have been legally intoxicated at the start of Saturday's game against the White Sox, in which he went 0-for-4. Cabrera wasn't the first big star to play in a key game hungover or drunk or otherwise self-medicated, and he won't be the last. That doesn't mean he doesn't have a problem. And when the team's got a $153 million commitment to the player, the team has the problem too. A fresh issue of Baseball America arrived Thursday, and this one features Top 20 prospects for each league in organized ball. The Twins prospects aren't particularly prominent on these lists, which perhaps figures. They've spent most of the past decade drafting in the bottom half, and until this year haven't been particularly active in pursuing the top level talent in the Caribbean basin. Eastern League (Double A): Wilson Ramos, C, 8. Missed half the season with injuries but performed well. Two other EL catchers are ranked ahead of him, but one (Jesus Montero, Yankees, No. 5) may not make it to the majors as a catcher. Florida State League (High A): Ben Revere, OF, 8; Carlos Gutierrez, RHP, 11; David Bromberg, RHP, 15; Chris Parmelee, 1B/OF, 17. Easily the best collection for the Twins, which perhaps figures; Revere, Gutierrez and Parmelee were all first-round picks (Bromberg went in the 32nd round). Revere (above) had just 19 extra base hits, which renews the red flag about his size (5-9, 166 pounds). But it's a pitchers league — kids playing at low altitude on fields built to house major league spring training. Which makes Parmelee's 16 homers and 44 extra base hits a bit more impressive. Of this bunch, Gutierrez is the best bet to be the first to the majors. 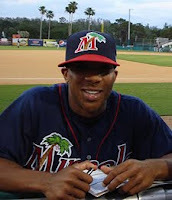 Midwest League (Low A) : Aaron Hicks, OF, 1. It's not that he tore up the MWL; he didn't. But he demonstrated the athletic ability the scouts saw in high school — and a rare sense of plate discipline. BA quotes a National League scout: "He's the most dynamic, projectable position player I saw. He can play a premium position and he has a chance to be a five-tool guy." He's just 19, and it will be awhile. But he is going to be something special. Appalachian League (High Rookie): Tyler Ladendorf, SS, 12. And he's out of the system, traded to Oakland for Orlando Cabrera. Elizabethton, the Twins affiliate, had a big year, but apparently didn't impress the scouts much. Gulf Coast League (Low Rookie): Adrian Salcedo, RHP, 6; B.J Hermsen, RHP, 11. Salcedo's stats are off the charts. Three walks and 58 strikeouts? A good example of why stats on levels that low aren't necessarily meaningful. For that matter, Hermsen had 4 walks, 42 Ks. No drama to this one. Twins took the early lead, and the Yankees scored the next seven. I've been skeptical of the way Ron Gardenhire handled his starting pitching the last three games, in part because the choices he made culminated in this game. Brian Duensing was scheduled to start Sunday, but Gardenhire chose to use Carl Pavano on short rest. Had he started Duensing on Sunday, he could have started Pavano — who has pitched much better against the Tigers than Scott Baker — in Tuesday's game 163. Which, in turn, would have freed Baker, his best starter and one with some success in the past against New York, to pitch Game 1 of the ALDS. It is true that the Sunday and Tuesday games were essentially elimination games, and Tuesday's wasn't. The Twins had to win those first two games, and they did. And Duensing's previous two starts were unimpressive (a combined 10 1/3 innings with eight earned runs). But the net effect of putting off Duensing's start was to step up the quality of opposition. Afraid to trust Duensing against weaker teams, Gardenhire found himself forced to start him against the best team in the league. Duensing did throw strikes — 59 of them in 79 pitches. But during his good run of starts, he kept the ball in the yard, and Derek Jeter took him deep on Wednesday. Which makes three starts in a row with a home run allowed. Scattered hits: In a book about the Twins 1991 season, Tom Kelly said he figured that if the Twins got 10 hits in a game they'd score plenty of runs. The Twins got 10 hits Wednesday, and scored just two runs, one of them on a passed ball. Why so few? Because there was just one extra base hit and one walk. And an inconveniently timed DP in the middle of the Twins two-run inning. So the Twins, heavy underdogs, are down 1-0 in the best of five series. At least they might get some sleep before the next game. There's something about this AP photo from Tuesday night that I just love. 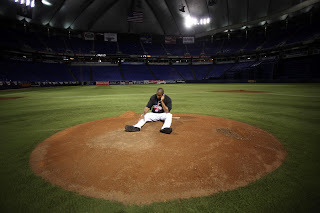 Delmon Young on his cell phone sitting on the Metrodome pitching mound in the dark. It's a forlorn image at a time of great joy — he's out there for the call because there's a party in the clubhouse — in an empty arena ball park that's supposed to be dead now, at least for baseball. It ain't dead yet. The Dome will not die, at least not easily and certainly not quietly. There was very little quiet to Tuesday's game. There is something simultaneously hopelessly hokey and soul-stirring to the sound of some 54,000 people sing-shouting to a Journey song — Don't stop believin' — and laughable about their replacing a reference to Detroit with boos. There is something odd about the guy who sat about a dozen feet away, a tattoo of this much-derided arena on his left biceps peaking out from the sleeve of his Michael Cuddyer T-shirt. I can't help but wonder: Is he going to be happy with that piece of body art in 20 years? The game was a tease, riddled with mood swings, alternating brilliant exploits with jarring mistakes in judgment and spicing the mix with a few blown calls. Did the Dome have something to do with it? Probably. Baseball is a liquid; it takes the shape of its container. The contest is always shaped by the venue. Maybe Ryan Raburn would have misplayed Cuddyer's single to lead off the bottom of the 10th in another stadium. But it was in this one, in this mutant mushroom with plastic carpet atop concrete, and when the ball skipped past him only Cuddyer's lack of speed made it a triple rather than an inside-the-park homer. Cuddyer was still on third one out later with Matt Tolbert at the plate when I noticed water falling onto the aisle steps. The Dome was leaking. Or crying. Moments later Tolbert singled to tie the game anew. And the weeping Dome was just leaky. And two innings later, another light-hitting infielder would insure himself a place in Twins lore with a game-winning single — this after screwing up as a pinch runner. And we'll Casilla later today. The Yankees have generally had immunity to whatever infection the Metrodome imposes on visitors, and this series opens in the Bronx, but there will be baseball played again at the Dome. Perhaps the Dome can stave off its baseball demise a bit longer still. I'm still absorbing one of the strangest, and best, games I've ever attended. So much to say about Tuesday's 6-5 12-inning tiebreaker. I'll start with this: I was seated in the upper deck right field, which means that the right fielder was just a rumor to me and that home plate was about 400 feet away. To my eyes, the home plate ump (Randy Marsh) was brutal. I understand, having perused a few stories and columns since I got home, that people with a better angle than I agree. *Nick Punto was a marvel. His last three plate appearances were superb — a single on a 3-2 pitch (and a run scored), a walk on another 3-2 pitch, and what should have been the game-winning sac fly. I believe he fell behind in all three at-bats and battled back. Plus he had that marvelous force play at the plate to save Bobby Keppel's bacon in the 12th inning. * That forceout followed what I thought was a questionable decision by Ron Gardenhire to walk Ryan Raburn intentionally to load the bases. Yeah, Raburn is a better hitter than Brandon Inge or Gerald Laird; that's not saying much. My issue with it is that Keppel's command is always dicey. Inge bounced into the force play, but only after apparently getting grazed by a Keppel pitch. I thought it caught his jersey, at least, but — again — I was 400 feet away, and if that's the best place to call pitches they'd put the ump out there. Laird followed the force out by getting ahead 3-1; I said to the guy next to me that Jim Leyland should give him the take sign. Instead, Laird fouled a pitch off — I suspect it was high — to go to 3-2, then chased a low pitch for the strike out. Questionable decision by Gardy, worse one by Leyland. * I wanted Brian Buscher to pinch hit for Alexi Casilla in the 12th. Gardenhire had other ideas. His worked. Still, Casilla had had just two at-bats since Sept. 11, as Gardenhire follows his pattern of running with a set lineup in the final month — and Casilla was the worst hitter with 200 plate appearances in the AL this year. And he was in the DH slot, so defense wasn't a consideration. But then, Buscher has had one game appearance — no trips to the plate — since Sept. 19. *Rick Porcello struck out eight Twins. That matched his season high. Considering his low K rate — 4.4 K/ entering the game — and the tight leash on innings he's been kept on — I'm surprised he'd had an eight strikeout game. If he stays healthy, he's going to be great. * Leyland apparently boiled his bullpen down the four guys he was willing to take a chance with: Fu-Te Ni, Zach Miner, Brandon Lyon and Fernando Rodney, which is how he wound up having his closer throw 48 pitches. Gardenhire went a lot deeper than that — I think he would have used Jeff Manship in the 13th if the game had gone that far — and was, if anything, over aggressive in pulling Ron Mahay after one batter. * Jose Mijares may have hit the wall. Or be scared by the Delmon Young incident last week. Or something. Whatever it is, he's been brutal his last few outings, and they'll need him effective against New York. * Other than Jason Kubel's home run — and wasn't that a bomb? — the Twins' RBIs came from Matt Tolbert, Casilla and Orlando Cabrera. Joe Mauer reached base four times, but when he came up with men on base, he was walked. *Miguel (Drunk Tank) Cabrera doubled, walked and had a two-run homer (plus three ground outs). Had he rung up another 0-fer as he did through the White Sox series last weekend, he would have been a prime scrapegoat for the Tigers' failure to win the divisional title. He still may be, but he's still Detroit's best player. Which, in a way, only deepens their dilemma about what to do with his behavior.